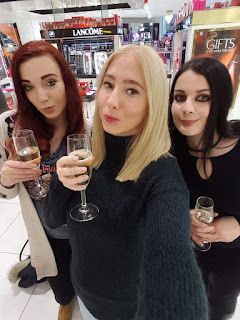 Tales From A Geordie Goth : Another Year Over, Another One Begins. Another Year Over, Another One Begins. Well, I can't believe it's another year other again, it feels like only yesterday, since I was posting about News Year resolutions, I don't really know how, to begin with describing last year, I feel it has to be one of the worst years on a global perspective. At the beginning of the year, we had the loss of so many talented and beloved celebrities. With artists such as David Bowie, Prince, and one of my favourite actor's Alan Rickman. The theme has continued throughout the year with recent loss' of Carrie Fisher and Debbie Reynolds. Do I dare mention the recent political changes and turmoil? I'm not even attempting to discuss that one any further. For me, this has been one of the best years possible. I've had so many wonderful things happen and met some amazing people. I've purchased my first home thanks to the generosity of my partner and family. Somehow, I've managed to lose half a stone of stubborn weight without, even trying. This year, I haven't really thought about resolutions or lifestyle changes. I always feel I must immediately implement the changes as soon as the clock strikes 12. I usually fail in the first week of January. I've been contemplating of new skills, knowledge, and perspective I've gained. I would like to expand more of these skills and develop further in a more of a sustainable way. Where it'll be permanent change rather than putting all my energy and drive into something that'll I give up within the first few weeks and give up. I want to make changes more permanent I think the best method is a gentle and gradual approach. Since purchasing the house, I've managed to develop a small bit DIY knowledge and skills I've managed to paint most the house and finally learned how to use a drill a few weeks ago. I had a couple pieces of kitchen bench left, I purchased a set of Ikea Adil legs for £2.50 and attached a set to the bench. I'm so fortuitous to have a really generous neighbour whose helped a lot during the house renovations including showing me how to attach the legs with a drill. I also learnt the difference between a hammer and a driver drill. For years, I always wanted to upcycle furniture. This year. I've finally done a couple of projects including my side table and dressing table. Also, I've finally got to grips with transforming charity shops finds with a spray paint. I'm still developing my skills here as a few of them have failed where the paints flaked off. I'm still unsure of the reasons why some have succeed and other haven't. I've trialled an abundance of new crafts, which was fun. I've had the opportunity to meet some fantastic and lovely bloggers. I finally got Jane from Breaking the Angel and made an amazing friend. 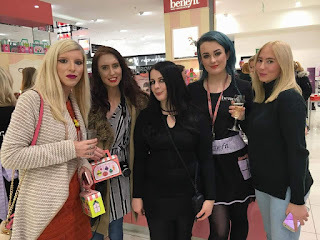 I've also got to attend some amazing Blogger events and met some lovely local bloggers. Including, Macara Macara Space, and Amy Anchored Teapot. Beauty bloggers Chloe Hxx and Toni Fashprenuer. I finally met Tim Sinister aka the Blogging Goth, it's a long storey but he owes me a pint. All the bloggers, I' ve me were just amazingly sweet and friendly. I think my aims for this year, is to develop more practical skills and focus on homemaking skills. I want to definitely expand my DIY skills and learn a few basic joinery skills. I want to improve and learn more culinary skills as most of my dinners involves mashed potatoes, carrots and bean sprouts, sounds healthy but it's can be bland. I want to make more excitement to my cooking. I can bake reasonable biscuits and scones I want to trial more Yorkshire puddings and maybe make a carrot cake or two. Since I now have the room, I like to devote more to homemade things from baking, clothing, making preserves, and maybe body products. I'm not sure how it'll go with my home experiments. Since we have a private yard, I would love to try and grow a few potted plants. With including the homemade ideas, I've seen some interesting idea on Pinterest on how to repurpose rubbish into useful objects, rather than throwing away. For the next few months, I wanna go on a boycott to unnecessary shopping. I'm going to attempt to sew my own clothing and wear what I currently own. Also, Pinterest has provided ideas on how to alter clothing, I'm going to try altering my old clothes to give them a new look. Currently, I can sew and even my tutor said I have advanced skills and could potentially do a lot more if I pushed myself more and took my time. I want to focus on improving my skill and particularly finishing garments of to higher standard and make sure my seams are lot neater. For example, I finally used a twin needle this year and want use it more, I want to sew a Simplicity 8020 blouse. I did attempt but the patterned test me to my limits and even my tutors. The toile, I made was a great learning curve as it had a number of issues. that can be resolved. This time I've been using more pattern drafting skill and would love to try more of it. As I've had a few projects where I wanted to redraft my current patterns to make something different rather than purchasing a new pattern. I'm thinking of signing for a new course. For now, I'm going to look on Youtube. I would also try to develop and foster some of my friendships with people, A lot of my friends I haven't seen in a while, and I would love to reconnect with them when possible. I've been Been feeling ill most of the day so, looking forward to a quiet night in with the boyfriend. ARGH! That's me! 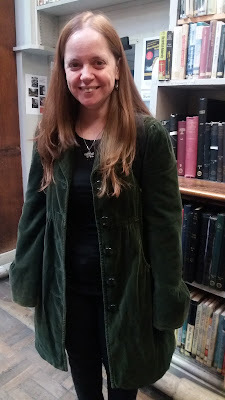 I think I have to retire my green velvet coat soon, it's falling apart! It was lovely to meet you too and hope to do so again soon. Glad that so many nice things have happened for you, like the house. Have a wonderful 2017. Wishing you a fabulous 2017 of even more DIY, crafting, sewing, etc. Make this YOUR special year! Arrhh, that so sweet. Yeap, I'm going to attempt more DIY, sewing and crafting. Maybe try some new stuff. I'll try to post about it. I'm hoping this a better year. Sounds like you had a great 2016. :D I hope your 2017 is wonderful, too. Happy New Year! Thanks it's been a good one. Same back Bane, I wish a fantastic New Year. I hope you're feeling better! Wishing you an amazing 2017, filled with much love, happiness and crafting!!! So happy you had a great 2016!! I did too! Oh, that so sweet. It great to know you have 2016. I'm wishing a fantastic New Year. Sarah, I hope you're feeling better. Even with parts of 2016 being pretty rough, it looks as though you've had a pretty accomplished year! Yay! for Blogger Meet-Ups. Meeting in person (when possible) is the best! Hope your 2017 is off to a great start! Oh, feeling a lot better I think it was a viral infection. For me it's been a great year. This year, has been very exciting and can't wait to see what happens in 2017. Hay no problems, drop by when you can. But Happy New Years to you. Thanks for asking, I'm a lot better, I think it was bit of a virus infection. The latter part has been amazing. Thanks I'm happy to know your looking forward to some crafty posts. That's sounds interesting with your DIY projects. I even quite enjoy reading some of your cosplay makes as it serves for good creativity stimulation.